A news from Forbes yesterday talks about several browser-based games are going to launch and funded by large business like Time Warner's and Dell. One of the famous title that was coming is the "Quake Life", which is a remake of the once top title "Quake III". More and more development companies, even Google, is becoming aware that the browser-based game market is a flourishing one. It looks like that we are going to have a bloom era of browser-based online gaming! Unfortunately, there is not many ways to increase your rate of stamina gain in FallenSword, and all of them involves FSP upgrades. The first and most straight-forward way, is your +1 Stamina Gain (per hour) in the Upgrade section. Each of them costs 25 FSP, and there is a maximum of 25 upgrades. The second way, is to have your guild building the Endurance Shrine structure. This would increase +5 stamina gain per hour every upgrade for every member in the guild, with a maximum of 3 upgrades. With the above 2 upgrades, you can have an increase of 40 stamina gain per hour, added up with your basic 50 stamina gain per hour, you can get a maximum of 90 stamina gain per hour in total. Another way to gain stamina, is with the +25 current stamina upgrade, which costs 1 FSP each. Therefore you can simply buy a lot of stamina using FSP after you had used up your pool during hunt. In FallenSword, besides managing your stamina by controlling your hunting frequency, knowing how to save your stamina is also very important. As we mentioned earlier, both walking the map and killing monsters require the use of stamina. Therefore, so as to save as much stamina as possible, you have to walk the map as little as possible and use as little as possible stamina to kill a monster as possible. The minimum stamina needed to kill a monster is 1. Yes, therefore we always want to kill the monster in 1-hit, so as to save the stamina. As we have discussed earlier in The Combat, to kill a monster in 1-hit, we always need to calculate Attack vs Defense, Damage vs Armor. If your Attack score is always higher than the monster you are killing and your Damage score is higher than Armor + HP of the monster you are killing, you can maintain 1-hit kill. Actually this is quite easy to be accomplished in the early stage of the game, as long as you always keep having the best items for your level, which we will talk later. Offensive buffs like Fury, Berserk and Dark Curse are also very important at higher level to maintain 1-hit kill. Besides minimizing the stamina to kill, you need to minimizing the steps you walk the map. It is not easy, especially at low level. Try walk the map systematically, in a way you can remember where did you walked already, so as to avoid stepping in the same square for duplicate times. If you found that the whole part of the map is having no monster, probably someone is just hunting in front of you. In this case, try to move to another end of the map, until you see at least 4-5 monsters in a square. When you are at higher level, when you can hunt around 10-20k gold per hunting, I will highly recommend you to buy the Doubler skill from Lv 200+ players. Having a Doubler skill means you use double (or triple if it is x3, quaduple if it is x4) stamina to kill a monster, with a double (or triple or quaduple) experience point gain. This allows you killing less monsters with the same stamina and having the same XP gain; in order word, less walking on the map. Animal Magnetism is another useful one, which increase the probability that a monster is regenerated at your square, which will also decrease your walking. Of course, Adept Learner (increase % XP gain) and Librarian (increase chance of double XP gain) is the two most important skills to maximize your speed of level up, which I will recommend you to buy from higher level players as soon as you can afford this; or get it from the guild. As we have blogged earlier, in FallenSword, managing your stamina is a key to success. At the very beginning, when you did not have any special item and not in any guild, you got a maximum of 500 stamina. The stamina generation rate is 50/hour. That means in 10 hours your stamina will overflow. Therefore, in order not to waste any stamina, you need to hunt at least once per 10 hours, or 2.5 times a day. After level 10, probably you are a member of a guild. If your guild has the Endurance Shrine, your maximum will increase, at a maximum of 620. If your guild got the Tranquil Retreat, your stamina regeneration rate will increase as well, to a maximum of 70/hour. In order not to waste any stamina, you need to keep the frequency of hunting as (Maximum stamina) / (Stamina Generation Rate). Therefore, in order to avoid being "labourous" in hunting, usually our first upgrade to our character using FSP would be increasing the maximum stamina. The new potion crafting and item creation function in FallenSword are launched on 11 August. It is quite a big addition to the game indeed. It allows players from various level get access to the higher level skill with high buff levels. There are a few steps to craft a potion. First you need to obtain a recipe. Currently the recipes are available in the shops in certain area, mainly the low level areas. If you are lazy to go back to the low level areas or want to save the stamina for doing so, you can buy a recipe from other players in the auction house. I find it worth the price, as stamina is far more expensive. Next you need to get a potion bottle. Current it is available in the Hugards Tent in Fire Chasm level 1, which is a very low level area. This potion bottle are available in the auction house under "quest items" as well. Finally you need the resources to create the potion. This resources are mainly drops from killing monsters. Again you may get them from the auction, as many players had took the time to hunt them. When you get everything, voila! You can go to the menu option Actions -> Inventing to create your potion. At first you only get an average chance of success. If you have the high level potion crafting buff, you can increase the chance of successfully create a potion. Currently the potion can be sold with a good price in the auction house as well. I have just played 2 days of The Legacy of Holy Castle, and now I have 40 castle area, 158 credits and 53 units and 3 heroes. I am not sure whether this is treated as successful, I guess this is not too bad. First of all, when you just started playing the game, finish the "Novice Quest". This will guide you through the main parts of the game and give you several gold and food rewards. At the end of the quests, you will have 50 archer units as the reward. After that, keep upgrade your silver mine. It is never too much, as gold is very essential to your success in The Legacy of Holy Castle. Besides the silver mine, remember to build a tavern early, this is used for recruiting heroes. After you got your tavern, recruits 2 heroes, 1 with high body statistics (high VIT, STR, AGI) and 1 with high intelligent (WIS). As wood is also very essential for the game, you have to always keep 1 hero busy with lumbering. Choose your high WIS hero for this job, as high WIS is account for high wood yield. For your main hero, always keep him adventuring, killing enemies in the Village. This will gain him experience point and thus higher statistic and better for PvP. More important, he will have chance to gain crystal drop from the battle field. These crystals, can be combined to synthesis hero items, or can be sold for gems in the market place (auction). For the other hero, which with high body statistics, you can keep him half of the time adventuring, and half of the time lumbering (depends on your need of wood for building). When you found the upgrade cost of silver mine becomes much higher than Field upgrade cost, you can upgrade the fields as well. Although food is not much used during the protected period, the food can be sold at the marketplace for gold. Remember to use the marketplace wisely, always exchange materials, goods that you are in need most to keep your pace of upgrade high. Just started playing another interesting browser-based strategy type of multiplayer game - The Legacy of Holy Castle. I found that I like this game very much. At the beginning I thought this is just another clone of Travian. After I play a few hours, I found The Legacy of Holy Castle has more interesting elements than simply empire building and warring against each other. I like The Legacy of Holy Castle's concept of hero. Although there is also heroes in Travian-like strategy, but there are more role-playing element introduced in The Legacy of Holy Castle. The hero can perform many different tasks - he can chop wood for your kingdom, he can go out and search resource and rare elements for you, he can be trained to gain experience, he can even go out to adventure and gain the experience point to level up. During adventure, he can defeat various enemy, and he can get items dropped (mostly crystals which can be used to craft other items). The experience point earned can be used to buy ability points which futher strengthen up the hero. The Legacy of Holy Castle has less graphic interface and besides the hero battling interface, most parts of the game is text-based, which in my opinion, is quite clean and good-looking. The optimization of stamina is the most important player skill in FallenSword. If you can manage your stamina well, you are successful in FallenSword. Every action in FallenSword requires stamina. Each step you walk on the world map require 1 point of stamina in the horizontal and vertical directions (N, S, E, W), and 2 points of stamina in the diagonal directions (NE, NW, SE, SW). When you kill monsters, each hit to the monsters require 1 point of stamina; that is, if a monster requires 3-hit to be killed, 3 points of stamina are used. Using skills require stamina as well: most skills use about 10 points of stamina. Some skills, like the Dark Curse and Treasure Hunter, require more than 10. PvP requires stamina as well, each PvP combat will use up 10 points of stamina minimum no matter how many hits you deal to your enemy, and you can do 100 stamina kill if you really want to hurt your enemy. Being said that, getting stamina in FallenSword is not easy, and it is the ultimate goal of every FallenSword players. Every character starts with 500 maximum stamina and gains 50 stamina per hour. The next 2 chapter we will talk about how to save your stamina and how to earn your stamina respectively. FallenSwords News: 2 Million players reached and the Legendary Event again! Congratulations for FallenSword to reach 2,000,000 registered players today! Again, for celebrating the event, there is a Legendary Event. FallenSword has post a news on the latest news box that they are still tweaking the new potion craft skills and they are estimating that the new high level skills announced earlier will be released this weekend. 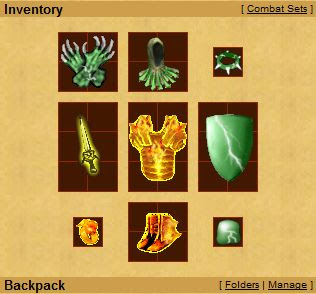 Also there will be a separate backpack for storing herbs which would be the components for crafting potion. There is another news posted today that FallenSword has stopped the selling of guilds due to large amount of guild-selling scammers. Also begging and borrowing of gold and FSP is no longer allowed in the Shoutbox and FSBox. Looks it is quite a nice announcement, as those guild-selling and begging messages in the FSBox are very annoying. Tagoria is quite an interesting browser-based multiplayer role-playing online game. In the game, you play as a character in the land of Tagoria. You can gain experience and level up by 2 means: by doing PvP and by killing monsters. Besides simply level up, you can buy training points - which are assigned to Strength, Dexterity, Agility, Stamina, Accuracy - by using amber stones which is the currency in Tagoria. In the beginning, you would probably like to gain experience and amber stone by killing other players. As the premium feature is available for free for the first few days of playing, you can easily choose players that are weaker than you to kill. After killing a few players, you have gained a level and owned some amber stone to buy training point, you can start doing quests and kill monsters in the Mountain. You got a number of action points and quest points everyday, so you would probably just need to play 15-30 minutes a day. Tagoria would be quite a leisure game which would not need a lot of intensive care and attention like most of other online games. Tagoria would be suitable for you if you are a leisure player. One nice feature of the game is you are able to work in a Farm, so that you can gain amber stones automatically while you are offline. The default language of the game is German, remember to select the English flag at the top right corner of the browser to switch your language if you are an English speaker. Enjoy!